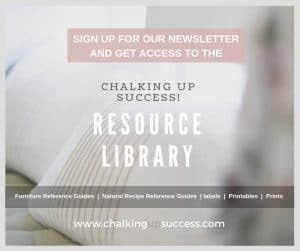 Beautiful outdoor rugs - get this year's 'it' accessory - Chalking Up Success! This summer, I managed to get my hands on a load of wooden pallets so my summer project kind of got decided for me! There will be a post coming once the whole project is finished but in the meantime, I thought I’d share with you the little projects in between. There are a few items I need to get, to bring this project together and one of those items is an outdoor rug. 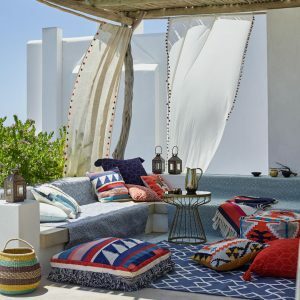 Now, outdoor rugs have changed enormously over the last few years and they’ve become the ‘must have’ of outdoor dining/sitting area accessories. 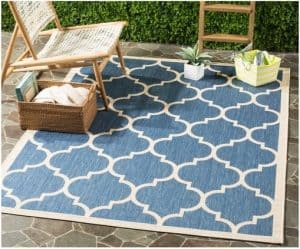 Outdoor rugs are perfect for hiding the ugly, so if your patio stones are looking a bit the worse for wear, a large area rug will cover all that up. For instance, if you’ve just bought a house, the garden is usually the last thing on the list for renovations. An outdoor rug can turn your space from eyesore to eye candy in a jiffy! 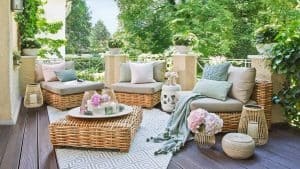 I also wrote about outdoor rugs in the post, 5 Affordable ways to improve your outdoor space which is another great read if you need to revamp you outdoor space on a tight budget. 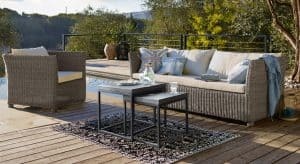 Outdoor rugs are available in all sorts of colours and patterns, and at first glance, you can’t even tell that they are made of plastic. 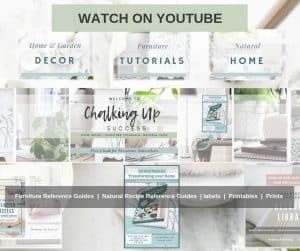 Now, when I say ‘plastic’, I mean recycled plastic – I must say, buying plastic products makes me feel more than a little uncomfortable these days. I mean, I know it’s unavoidable, plastic seems to be in everything, even the clothes we wear but if I can do without it then I absolutely will. I can’t keep watching all that TV footage showing the damage we are doing to our beautiful planet with the huge amount of waste we produce (who hasn’t seen the plastic whale footage and not wept buckets?) and then continue along my jolly way to my next plastic purchase! Anyway, I don’t want to get all heavy on you, you came here for the rugs I know, it’s just – well you know, every little helps when it comes to sustainability and we have to start somewhere. That’s why I was so pleased to find these beautiful rugs which are all made from recycled or recyclable materials. This means that when they’re old and worn and need replacing, they won’t end up killing our precious marine life, they’ll be recycled into something even more wonderful for someone else to enjoy! So without further ado, here are some of my favourites. 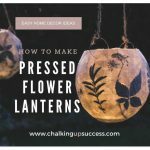 By the way, most of these are available in various colours and sizes so if you like the pattern, just click the link to see the whole range. Perfect for both indoor and outdoor use, these Weaver Green rugs from John Lewis are hand woven by craftspeople and made entirely from recycled plastic bottles. 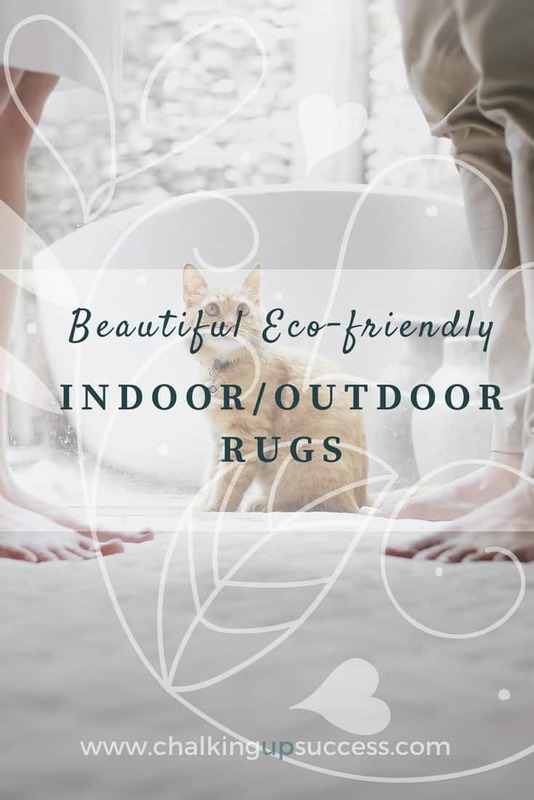 With great environmentally friendly credentials and using weaving houses inspected by Good Weave, these rugs look and feel like wool but are waterproof, mould resistant, washable and hard wearing. 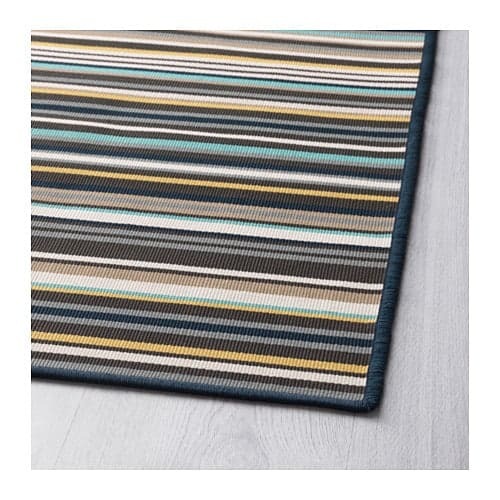 This gorgeous blue/beige rug ‘Danuta’ is made from 100% Polypropylene and is easy to clean with a damp cloth. 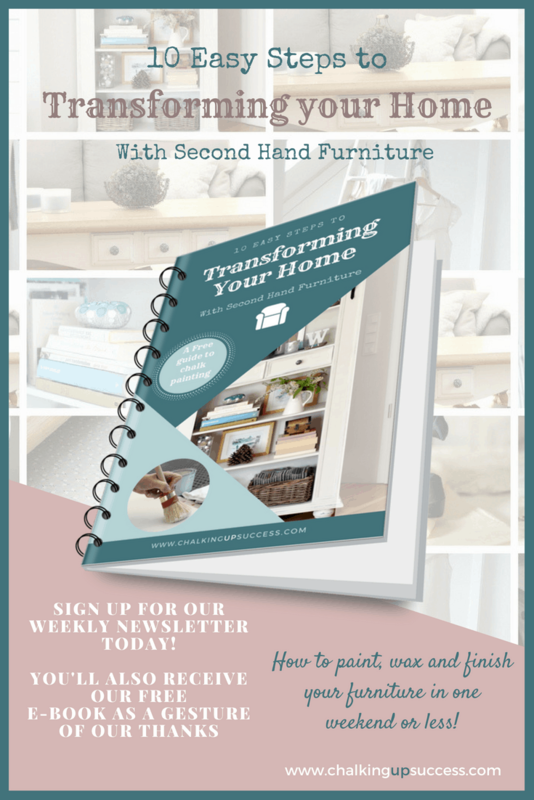 I absolutely love the pattern and colour of this one and think it would look just as good inside as out – Click the banner below to shop WestwingNow (Sorry, no longer available). 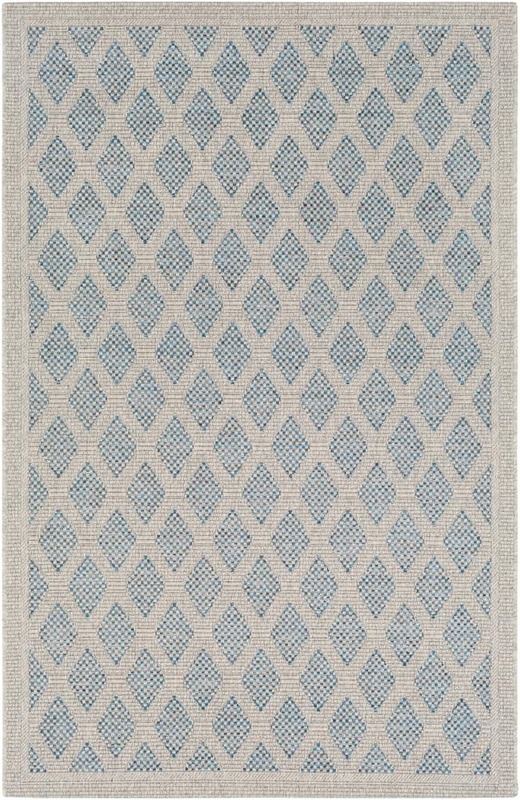 ‘Marmaris’ from Boutique Rugs is made from 100% Polypropylene and available in Light Gray, Sky Blue and Black. 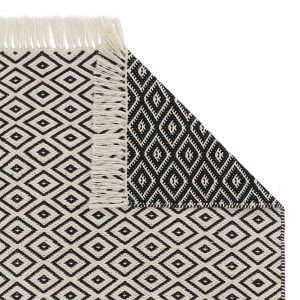 From Skandi to boho, this beautiful diamond pattern is so versatile and will complement any home style. 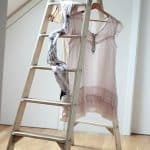 The gorgeous KÄRBÄK from IKEA is made from 100% Polypropylene and is reversible. It’s pretty durable for outdoor use as it withstands rain, sunlight, snow and pollution. 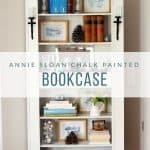 Easy to clean with mild detergent and a soft brush. 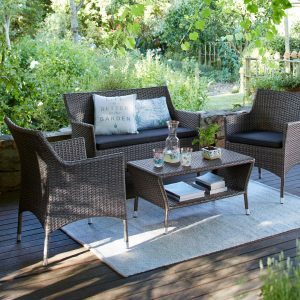 Available in grey or beige ‘Meadow’ from WestwingNow conjures discreet boho flair in your home – or on your terrace. Made from polypropylene Meadow is UV and mildew resistant and also suitable for underfloor heating. Click the banner below to shop WestwingNow. (Sorry, no longer available). Just like Paradise! Conjure up the summery light atmosphere of the Greek Islands on your balcony or terrace. 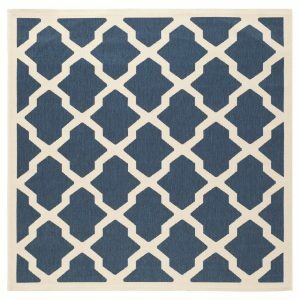 This blue/cream reversible rug ‘Marietta’ from WestwingNow is made from polypropylene and is robust and weatherproof. 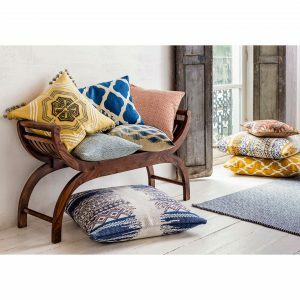 The Barota Collection from Urbanara is handwoven from 100% recycled PET. 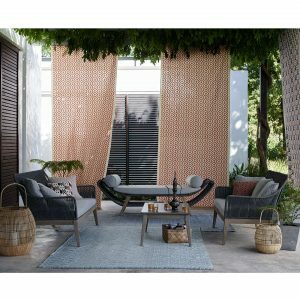 This durable material feels like wool and will look lovely on your balcony or terrace. The reversible diamond pattern with fringes is timeless and you can choose one of the two sides as you like. 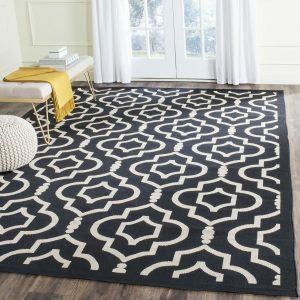 Remember, most of the rugs above are available in other colours and sizes too. I just chose these because these are the kind of colours I’m looking for to complete my summer project this year. Well, that’s my round-up finished. 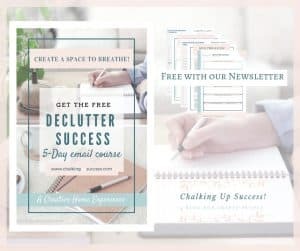 Now comes the hardest part of all – choosing one!